Skeletal mount of Edmontosaurus annectens, copyright Andytang20. 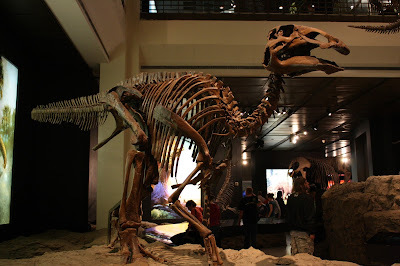 The Hadrosaurinae are a lineage of hadrosaurid dinosaurs that were mostly crestless, or possessed a solid crest formed from an extension of the nasal bones. The clade as given below is supported by the presence of a caudal margin on the circumnarial fossa (Horner et al. 2004). Members of the genus Edmontosaurus include some of the largest and best known hadrosaurids, reaching lengths of around twelve metres or more. [HWF04] Horner, J. R., D. B. Weishampel & C. A. Forster. 2004. Hadrosauridae. In: Weishampel, D. B., P. Dodson & H. Osmólska (eds) The Dinosauria 2nd ed. pp. 438–463. University of California Press: Berkeley.